SEOUL, May 6 (Yonhap) -- The worst fine dust of 2017 blanketed much of South Korea on Saturday, as the authorities issued health warnings against the sandy, chemical-laden wind from China. 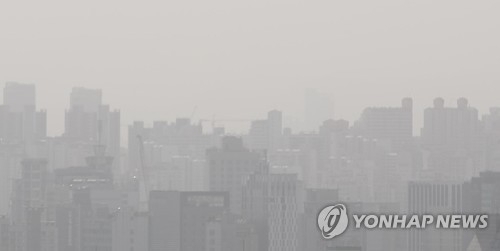 The National Institute of Environmental Research (NIER) said fine dust warnings have been issued in 12 cities and counties nationwide as of 7:30 a.m. Seoul and a few other regions have been placed under an advisory. The fine dust warning is issued when an hourly average dust concentration of more than 300 micrograms per cubic meter (㎍/㎥) is expected to last for more than two hours. The concentration of more than 150 ㎍/㎥ lasting longer than two hours leads to an advisory. When these warnings or advisories are in place, people are advised to stay indoors or wear protective masks if they must venture outside. 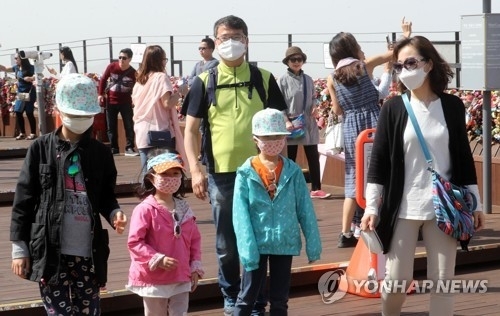 The Korea Meteorological Administration (KMA) said dust particles are expected to remain on the peninsula through Sunday. Originating from the deserts in southern Mongolia and northern China, the dusty air flew into the Korean Peninsula on a strong wind over the weekend. At 9 a.m., Seoul's atmospheric concentration levels of "particulate matter (PM)-10" pollutants reached 235 ㎍/㎥. PM-10 refers to airborne particles 10 micrometers or less in diameter. Epidemiological evidence indicates that exposure to such pollutants causes cardiac and respiratory problems. The level dipped slightly early in the afternoon but rose to 265 ㎍/㎥ by 3 p.m., according to the KMA. Ansan, Gyeonggi Province, lying some 40 kilometers west of Seoul, had the highest PM-10 level in the nation with 650 ㎍/㎥. Regions in the southern and eastern parts of the nation weren't immune, as Busan, some 450 kilometers southeast of Seoul, had a PM-10 reading of 226 ㎍/㎥. The KMA said the particles are expected to stay in the country through Sunday. A study conducted from May 2015 to December 2016 showed last Thursday that 55 percent of the fine dust particles in the capital come from abroad, up from 49 percent in 2011. Saturday is the second day of a three-day weekend, which began with Children's Day on Friday. With poor air conditions apparently keeping many indoors, major highways were relatively empty in the morning hours, according to the Korea Expressway Corp.